It isn’t hard to find a life coach these days, but it is hard to find a good life coach. By “good” I mean an experienced professional with a solid track record of helping people achieve richer, happier lives. There are a lot of people out there who call themselves life coaches, personal coaches, success coaches, relationship coaches…you name it, there’s probably someone out there who says they “specialize” in it. But how can you be sure they are trustworthy? At the moment, the U.S. government does not require any type of license or exam for life coaches. That means anyone can call themselves a life coach, even if they have no training whatsoever. Why would you trust a person like that with helping you achieve your most cherished ambitions? That is why it is always a good idea to look for a life coach who is already a licensed doctor specializing in psychology. This type of fully qualified professional is the kind of life coach that Dallas Counseling Associates can offer you. No matter what your circumstances are, how discouraged you might be, what disadvantages you think you might have, how many times you have failed or how great your ambitions are, we can help you be who you want to be. We can help you do what you’ve only dreamed of doing. Does it sound unbelievable? We have the credentials and the track record to back it up. Many people try to explain the difference between counseling and life coaching through the number-line analogy. They use negative and positive numbers to show a person’s emotional state. According to these people, counseling brings people from a place of pain (-5) to a place of neutrality (0), while life coaching takes people from that ordinary state to a place of happiness and success (5 or even 10). But this is a lie. Life cannot be so easily “graded” on a simple number scale. From our years of actual experience working with clients from all walks of life, I can say with authority that this simple analogy is inaccurate and misleading. A person can be -10 in one aspect of his/her life (for example his/her marriage) but +10 in another (like his/her career). The point of life coaching is to help such people achieve a healthy and sustainable balance in their lives. Take a look at this diagram. On a scale of 1 to 10, with 10 being the highest, how are you doing? 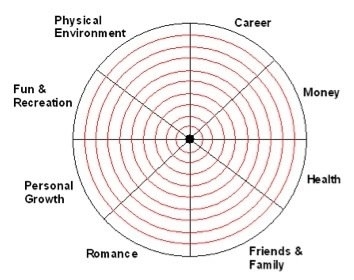 Chances are you are unhappy with your performance in one or more of these areas. That’s where a life coach can make a world of difference. We can schedule your first life coaching session as early as the day after you call us. In addition, our life coaches are experienced in many different counseling mediums. Whether you prefer to have your coaching session in person, over the telephone or over the Internet, we can accommodate you and still ensure high quality care. From your first call until your last visit to our offices, you will always be treated with the sympathetic and nonjudgmental attention that you deserve. You are an individual with unlimited potential to live a great life. We can schedule your first face-to-face life coaching session the same week that you call, or even on the very same day. And when you do call us to schedule your first face-to-face consultation, you won’t be talking to a secretary or receptionist. You’ll be talking directly to Stacy from Dallas Counseling. Best of all, we won’t be charging you anything for this telephone consultation. We offer it because we pride ourselves on our client-centered approach. We focus on the needs of our clients, which is why we fit ourselves around their schedules, NOT the other way around. If you call us today and reach our voicemail, it only means that we are with another client. Simply leave us a message, and we will get back to you within the day—often within the hour. You can start living a richer and happier life today. And it all starts with a simple phone call or email. Don’t let this opportunity pass you by.